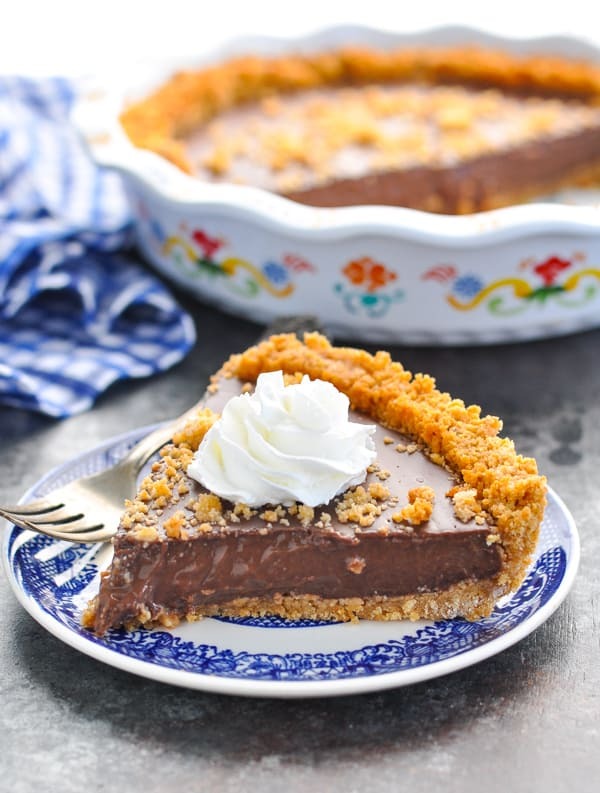 A family favorite for generations, this homemade Chocolate Pudding Pie with a graham cracker crust is the perfect simple, rich, and easy dessert for any occasion! 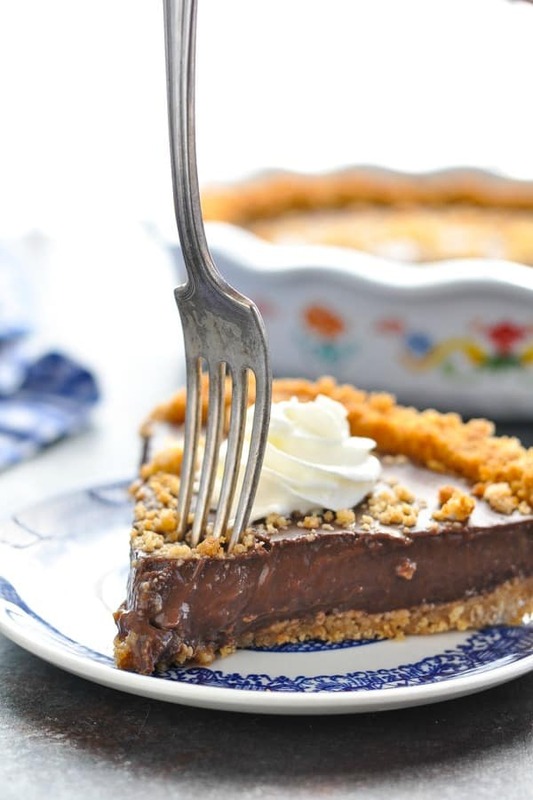 A family favorite for generations, this homemade Chocolate Pudding Pie with a graham cracker crust is the perfect simple, rich, and easy dessert recipe for any occasion! This is the same recipe that Joyce’s grandmother made for her, and which she has been making for her friends and family for as long as she can remember. Joyce assured me that this Jell-O Cook and Serve Chocolate Pudding Pie recipe is always a guaranteed crowd-pleaser, and now I know why! 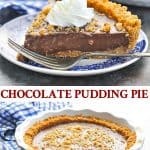 How do you make Chocolate Pie with pudding? 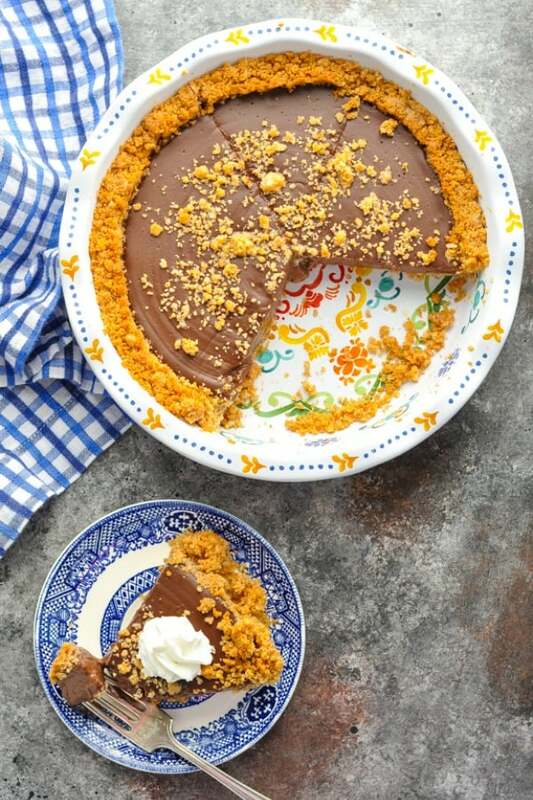 This easy chocolate pie comes together with just 5 ingredients (or a few more, if making your own graham cracker crust)! You can start with a store-bought graham cracker crust, or for a real treat, prepare your own graham cracker crust. Trust me — it’s worth the extra step! 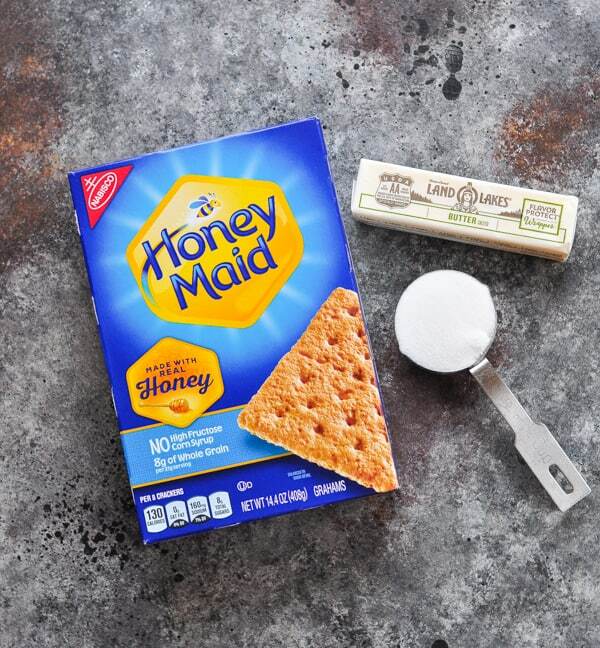 You only need 3 ingredients for a homemade crust: graham crackers, butter and sugar. Start by processing or crushing the graham crackers into fine crumbs. 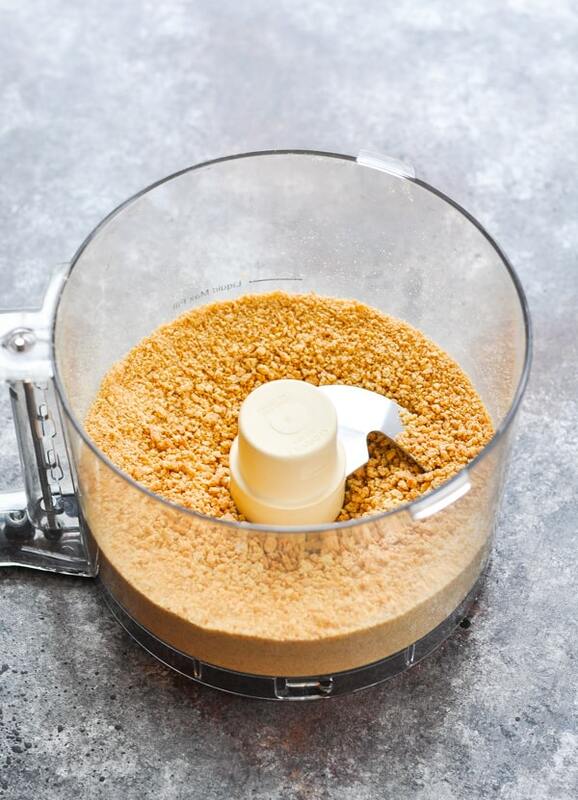 Combine the graham cracker crumbs with melted butter and sugar. Press the graham cracker mixture into a pie plate. I like to use the flat bottom of a small measuring cup to help press down the crust and to push the crumbs up the side of the dish. This does not need to be perfect, either! Bake the pie crust in a 375 degree F oven for 8-10 minutes, or just until it’s golden brown and firm. Then allow the crust to cool completely before preparing the filling. 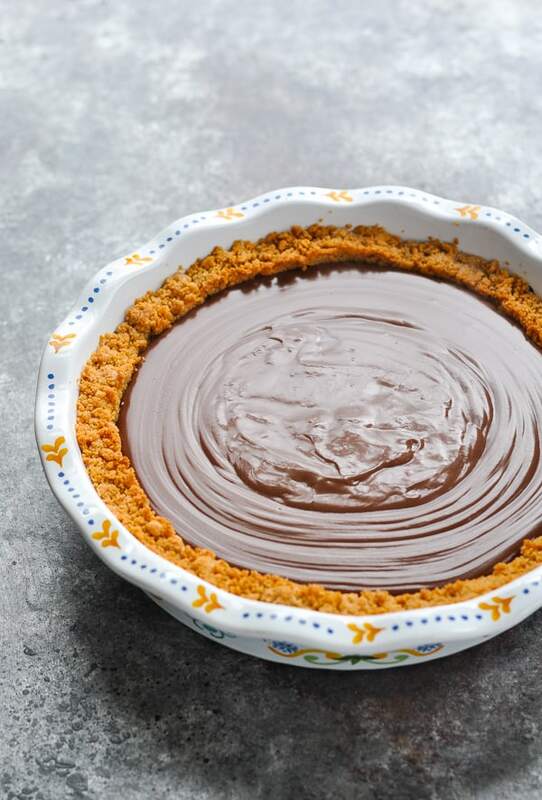 For the easy chocolate pudding pie filling, simple whisk together dry pudding mix, milk and unsweetened Baker’s chocolate in a saucepan over medium heat until it comes to a boil. The mixture should be perfectly smooth. Allow the filling to cool and thicken for about 5 minutes, and then pour it into the prepared crust. 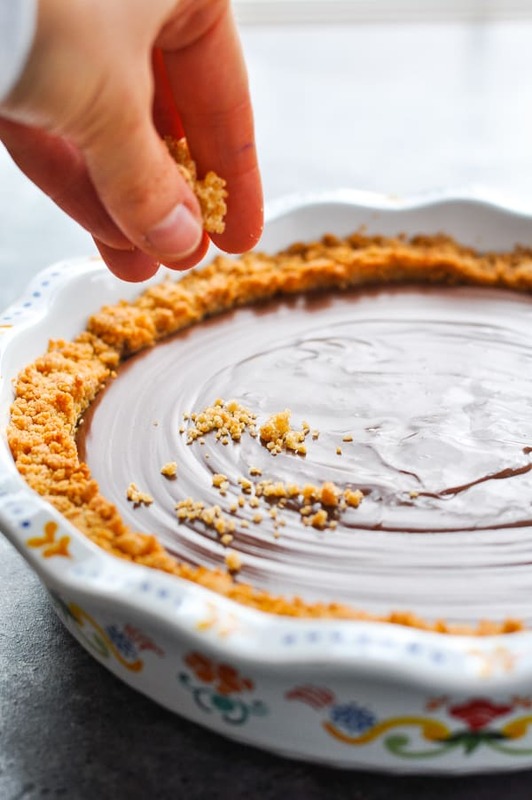 Sprinkle the top of the pie with reserved buttered graham cracker crumbs, and then refrigerate for at least 3 hours (or until the pudding sets). Garnish with whipped cream or Cool Whip and serve! Does Chocolate Pudding Pie need to be refrigerated? Yes, this chocolate pudding pie needs to be stored in the refrigerator. It will keep for up to 2 days. Can you freeze Chocolate Pudding Pie? Yes! Allow the pie to cool completely. Wrap tightly and freeze for up to 1 month. Can you make Chocolate Pudding Pie in advance? Yes! This is a perfect make-ahead dessert. I usually prepare the pie the day before I plan to serve it so that I know it has plenty of time to chill and firm up. The pie will keep in the refrigerator for at least 2 days. 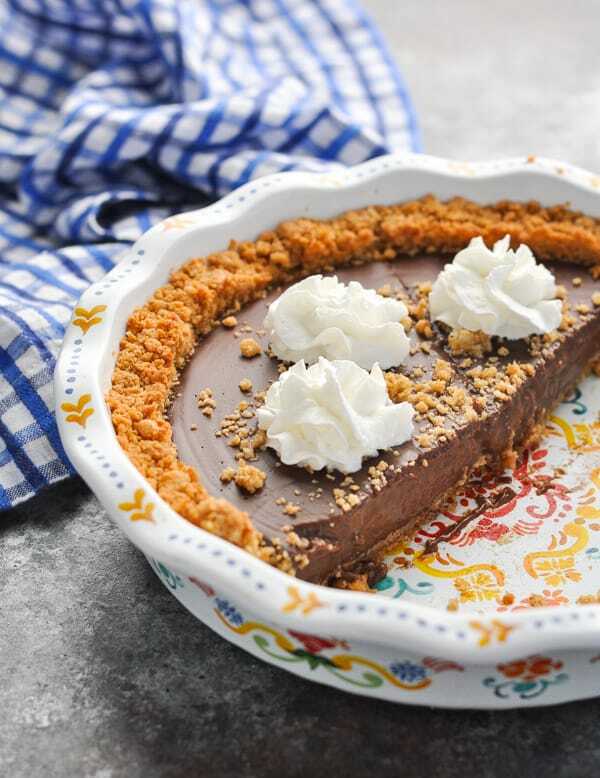 Serve this decadent chocolate pie with a dollop of whipped cream or Cool Whip for a light, fluffy, and creamy contrast to the rich, dark chocolate. You can add the whipped cream on each individual slice just before serving, or you can spread Cool Whip over the entire pie once the pudding has cooled. Make sure that you use a 5 ounce box of the Cook and Serve pudding. This is the larger box sold. The small boxes are only 3.4 ounces. Do NOT use instant pudding mix for this recipe. You want the “Cook and Serve” version. 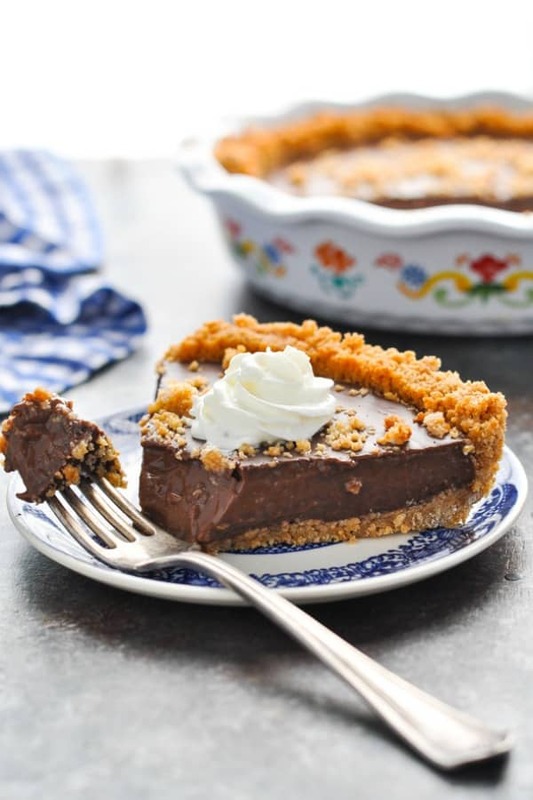 Try a Chocolate Pudding Pie with Oreo Crust instead of the graham cracker crust! Use other pudding flavors to create variations on this recipe. Try a White Chocolate Pudding Pie using the white chocolate pudding mix, try an Oreo Pudding Pie by adding crushed Oreo cookies to the pudding or by using the Oreo pudding mix. A Strawberry White Chocolate Pudding Pie using sliced fresh strawberries would be delicious, and so would an Oreo White Chocolate Pudding Pie! The options are endless when you mix up the pudding flavor and the crust flavor! Don’t forget the garnish! Make this Chocolate Pudding Pie with Graham Cracker Crust and Cool Whip (or whipped cream) for a special treat! You can serve a dollop of whipped cream on each slice, or you can spread Cool Whip over the top of the entire pie before slicing and serving. 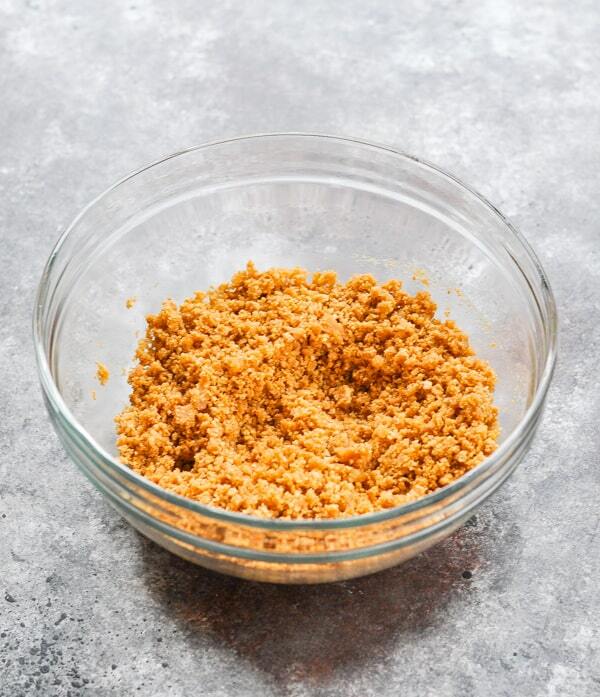 If you’re making your crust from scratch, combine graham cracker crumbs, sugar, and melted butter in a large bowl. Toss until all of the crumbs are evenly coated in butter. Set aside about 1-2 tablespoons of crumbs to garnish the top of your pie, if desired. Press crumbs into a pie dish and bake at 375 degrees for 8-10 minutes, or until golden brown. Allow pie crust to cool. 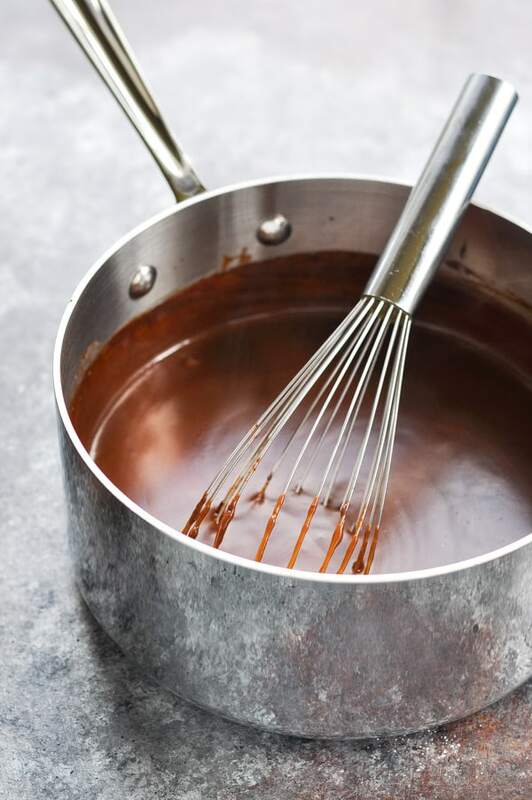 Stir together dry chocolate pudding mix, milk, and Baker’s Chocolate in a medium saucepan. Bring to a full boil on medium heat, stirring constantly with a whisk. Make sure that all of the chocolate is completely melted and incorporated into the pudding. The mixture should be completely smooth. Remove the saucepan from the heat. The filling will thicken as it cools, so wait about 5 minutes, whisking regularly so that the filling stays nice and smooth. After about 5 minutes, the filling should have thickened nicely. Pour the filling into the prepared crust. Sprinkle with reserved graham cracker crumbs, if desired. Refrigerate the pie for at least 3 hours, or until set. Slice and serve with whipped cream or Cool Whip on top. Nutrition information includes a homemade graham cracker crust and the pie filling. It does not include any additional whipped cream or Cool Whip garnish. Do NOT use instant pudding mix for this recipe. You want the "Cook and Serve" version. Don't forget the garnish! Make this Chocolate Pudding Pie with Graham Cracker Crust and Cool Whip (or whipped cream) for a special treat! You can serve a dollop of whipped cream on each slice, or you can spread Cool Whip over the top of the entire pie before slicing and serving. This recipe was originally published in July, 2014. It was updated in February, 2019. If it rich and has chocolate I’m in love! Looks amazing! Kaz — Yes! Indulgent and amazingly delicious! 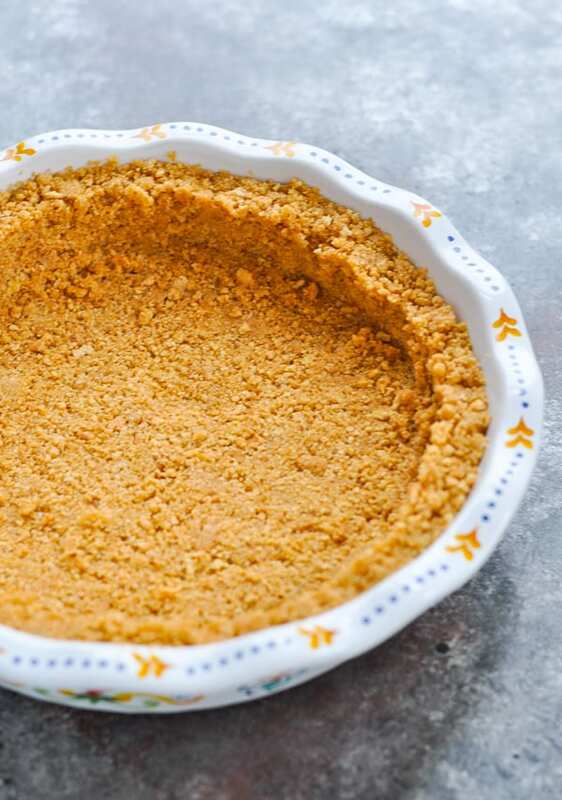 I’ve tried this with regular pie crust and I think graham cracker crust would be much tastier! This looks amazing, thanks for sharing! 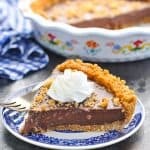 Love love love rich chocolate pie, this sounds like the perfect way to end a day. Great recipe Blair. Pinned! Thanks, Krista! I hope that you get to try it. It’s so simple and delicious! This looks so good! Thank you for linking up at Tickle My Tastebuds last week. I am featuring you tomorrow on my blog and would love if you would stop by with some more delicious recipes to share! Thanks for sharing this decadent pie with us at Best of the Weekend – I’ll be featuring it on my blog Friday! This looks so much better than your average chocolate pudding pie! Thank you so much for linking up at Tasty Tuesday! Your recipe has been pinned to the Tasty Tuesday Pinterest board! Please join us again this week! Ooh, I love generational recipes 🙂 Especially chocolate ones! Thanks for sharing, and your post was the “most viewed” and is featured in tonight’s What’d You Do This Weekend! Pinned! going to make this for a church function, looks so good! Awesome! Thanks, Mikki! I hope that you love it! if i wanted meringue on top, would i bake the pie first then bake it again the the meringue? or could i do it all in one go? Thank you so much for sharing your beautiful family with us, the wonderful recipes and photos. All of your time, energy and hard work in presenting your weeekly Our Week in Meals is greatly appreciated. I think all of your followers have fallen in love with your town and state just by your narratives. Wishing you and your family the very best in the New Year and happy holidays. Hi Blair, This pie brings me back to my childhood. My mother used to make a butterscotch pudding and layer bananas on the crust before adding the pudding.She did this with the chocolate as well. You should give it a try, Delicious! Oooooh! That sounds delicious, Lisa!! Is 3 c milk accurate. That is one cup more than the jello pudding package calls for. I’m worried that it might be too runny. Hello, thanks for the recipe, it was delicious. I didn’t get a chance to take pictures, be cause the pie didn’t last long and I wasn’t fast enough. I will make it again, this time adding Tapioca pudding to the chocolate. Will make sure this time I take pictures before, it gets to the dining room table, 😏.